Photo sent in by Allan Fulcher, Sunderland. Sunderland Junior Technical School in the 1940's situated in Villiers Street. It had no playground, but had cycle racks at the front of the building (as you can see at the R/H side). It was quite common to have Technical Schools in the town centre in those days. A Technical School (or college) was an alternative to a Grammar School, but the pupil was still required to pass an exam. I can add a little about the date of the Villiers Street Junior Technical School. It is pre 1946. I noticed none of the pupils were wearing School Blazers. These were brown and had a school Badge. While never compulsory quite a lot of pupils parents forked out both cash and clothing coupons to provide one in 1946 when I started. However, the real clue is none of the pupils were wearing the short white jacket that we all wore under our normal jackets. These were similar to lab coats but only half length and one again they worn in 1946. I have a very small photograph in poor condition taken in front of the school and all pupils were wearing the white jackets beneath their jacket or blazer. I also have a half postcard holiday snap of a school organised holiday in the Lake District circa 1948/49. I would also mention that entry to the school was not linked to the 11 plus. It was a separate exam and we entered at the age of 12. One further note. The photograph shows no indication of how run down the school was. I recall there was a newspaper or magazine article with photographs showing how poor the school toilet facilities were. I have no idea whether this was local or national media. Not that the pupils worried about the facilities, as in many cases they were better than available at home. I was at J.T.S from 1940 to 1943. The teachers by the cycle rack on the right are, the head Mr A. A. Canney and I think Mr Bertie Hunnam. As stated, kids whose parents could afford it wore the school ginger blazer. Those not so fortunate wore whatever. I was in the latter. We all wore white jackets. I was in the 'A' entry and can still remember the class register. I live in Devon now and occasionally get home. Looked in at Villiers Street on my last visit north. The old school was some sort of reception centre, I think. Regards to anyone who remembers me. This was in 1943 and there was some kind of confrontation in progress with the Nazis. Sure the conditions were not the standards of today, the gym was on Tatham street. The fields were some distance away, Sparks Field I think, and we had to pass the history teachers house (Mr.Petch). I was quite taken aback to see this photograph as I came across it quite accidentally. The school had quite a good reputation I believe, I was pleased to have attended. Back Row: Hindmarch, Sharpe, Colling, Dunn, Grieves, Churchill, Galey and Forster. Middle Row: Watson, Davison, Lawson, Alcock, Mr.X, Couch, Davis, Cruickshank, Scott, Wilkinson and Kendrick. Front Row: Smith, Mr. X, Mr.X, Mr. Hunnum, Mr.Canney, Mr.X, Mr.X, Freeman, and Richmond. I attended VSJTS in an "S" form in 1946, and wore the tan jacket and sawn-off lab coat. The headmaster then was Mr. Canney, who left the school to go to live and work in South Africa. He was replaced by a Mr. Hargreaves. 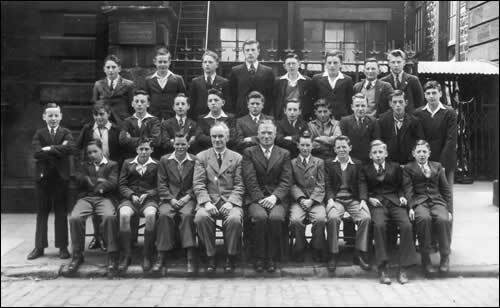 Teachers (or Masters) then were: Stephens (Physics), "Cabhoss" Campbell (Metalwork), "Pop" Duggan (Maths & Tech Drawing), Rollason (Chemistry), Carse (Maths) Davies (English & Music), Cox (History), "Basher" Bates (Woodwork & Building) and Bundred (Can't remember). Some of these were fine teachers who were highly respected by the pupils. Others were equally detested, getting away with behaviour that would see them barred from teaching in this age, particularly for their taste for the cane, which was wielded with ferocity and delight at the slightest instigation. Classmates were: Ian Blance, Arthur Chappel, George Tibbo, John Skinner, John Nazeby, Raymond Webster, Charlie Carmel, Johnny Johnson, Eric Goldsmith (deceased) and others not remembered, to whom I apologise. It was indeed a scruffy school. As I recall, it was adapted from an old church building, and it was then in what was a slum area, but I have to say that to me it was a fine school which gave many of us the best start in our careers that we could hope for, and I was proud to be an ex-student. I'd appreciate any contact from any of my schoolmates, or anyone who knows them. I too attended STS in 1946, in the "J" stream. In this class were Affleck, Allen, Armstrong, Bennet, Blake, Cadas, Campbell, Clark, Corner, Cowie, Dagg, Edmonson, Fisher, ForrestGeldert, Goldman, Glendenning, Humphries, Irving, Jenner, Johnson, Lawson, Lawson, Leng, McGough, Martin, Openshaw, Robertson, Stanger and Wilkinson. Any boy attending late was automatically awarded 'lines' in multiples of 100 on the whim of the gate prefect. 2 late comings in any week were caned in addition to the lines penalty. This could be 4 to 6 strokes, which ruined one's hands for eg. technical drawing. The respected teachers were Messrs. Campbell, Davies, Cox and Rallison. 'Pop' Duggan much less so, but he retired in 1947 to our great joy. The school badge on our blazers was the Sunderland coat-of-arms, a sextant and the motto 'Nil Desperandum'. The school curriculum was very good but it was mainly taught by hastily trained ex-servicemen with medieval concepts of justice and discipline. I was glad to attend, but equally glad to leave. I have re-read with interest the entries on our old school. I can add to the list of teachers. Hornsby taught chemistry, an ex serviceman joined us to teach Physical Training, his name was I think Pearce and was the brother of the Labour MP. Bundred taught Geography and was fierce. Carse also taught English which largely consisted of reading from classical adventure stories, I seem to remember Moonfleet going on for ever. The reason for the lack of respect for Duggan's was homework. He gave us masses of it and insisted that it had be handed in the next morning, and he never ever marked it. But one thing I remember about our teachers, they cared. History came alive with Cox, Stephenson tried to do his best with a woeful lack of scientific instruments. He retired to a well earned rest and a younger university graduate tried his best with us but totally failed to control us. Bates tried hard to get us to saw straight lines without success. Woodwork teaching included two projects a cigarette box and a small wooden stool. A local wood merchant prepared bundles material which we went down and bought for our project. I remember the stool bundle cost 2/6. I still have a very sorry looking cigarette box, but alas my stool never made it out of the classroom. "Basher" gave it a good shake and it fell to pieces. I will never forget the courage of the group of teachers who took us to the lake district. We came from some of the roughest areas of Sunderland and most, including myself had never had an holiday away from home and we were a handful. In those days of rationing, it must of been hard to feed us never mind taking us on walks to see some of the best scenery we have ever seen. Scenery in Sunderland was composed of Mowbray Park and Hylton Woods, Deptford where I was brought up, was bare of trees and if they had been any, they would have been chopped down in that terrible winter of 1947. Loved the Junior Tech, but unfortunately the technical education was all to no avail. My father, Mr Canney, was the headmaster at the Junior Tech. He did firewatching on the roof during the war. The school was in what I think was a slum area. During the war, local women were forever 'losing' their ration books so they'd come to him as a responsible person to get him to sign the papers for new ones. He also took another degree during the war, which meant him travelling in the blackout to Newcastle University in the evenings. In 1947 he took up a post in Johannesburg as headmaster of the Witwaterstrand Technical School. After that he worked for Unesco in Siam and Ecuador before returning to Sunderland. He retired to Lavenhan in Suffolk.